Round Hill Town Hall is located at 23 Main Street, Round Hill, VA 20141; phone: 540-338-7878. Photo: Woodgrove, ca. 1785, 1840, & 1910, 16860 Woodgrove Road, Round Hill, VA. Listed on the National Register of Historic Places in 2002. Photographed by user:Jerrye and Roy Klotz, MD, 2007, (own work) [cc-by-3.0 (creativecommons.org/licenses/by/3.0)], via Wikimedia Commons, accessed January, 2016. Situated at the foothills of the Blue Ridge Mountains, Round Hill is one of seven incorporated towns in the county and developed in the mid-19th-century as a postal stop at the junction of the Leesburg-Snicker's Gap Turnpike (Virginia Business Route 7) and the road that ran north to Woodgrove (Route 719). It was not until the beginning of the last quarter of the 19th century, however, with the construction of the Washington and Old Dominion (W&OD) Railroad, that the town grew and developed as a commercial and residential area that catered both to full-time residents and summer vacationers from Washington, D.C.
As early as the 1850 federal census, Round Hill was sufficiently important in that portion of the county to be identified by name as a community in the ten-year enumeration. As an indication of its growing importance along the turnpike, the residents of the area successfully petitioned for a post office in 1857 to be known as Round Hill, likely named for a local home and a small rounded hill located nearby. The small settlement, however, had been identified that way as early as 1850. With its location on the Snickersville Pike, Round Hill supplanted Woodgrove only one mile to the north, thriving as both a commercial center for the rural area between Leesburg and Snickers Gap and later as a vacation destination for those seeking to escape Washington in the summer months. The village began its significant ascent as an important transportation stop with the extension of the Washington and Old Dominion Railroad from Hamilton to Round Hill in 1874. Round Hill was the western terminus of the rail line for twenty-five years, only relinquishing that position in 1900 when the rails were extended to Bluemont four miles farther west at the base of the Blue Ridge Mountains. Stylish Victorian-era boardinghouses, a broad range of vernacular and high-style dwellings, a small collection of African-American residences, a railroad station and freight depot, four mercantile operations, two manufacturing facilities, several agricultural buildings, and four churches combine to illustrate the whole range of Round Hill's history. Two builders, Barney Noland and Arch Simpson, dominated the construction business in Round Hill in its heyday. The town's streets are organized in a basic grid plan with several minor accommodations to the railroad right-of-way. 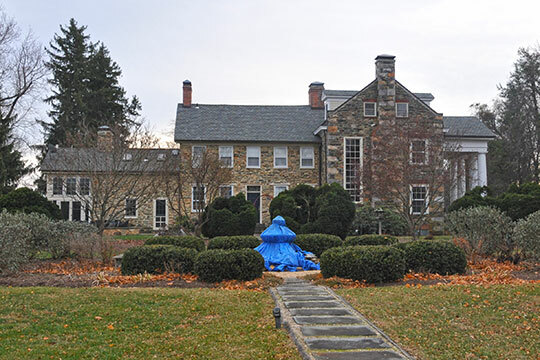 Maral S. Kalbian, Architectural Historian and Margaret T. Peters, Historian, Maral S. Kalbian LLC, Round Hill Historic District, Loudoun County, VA, nomination document, 2008, National Park Service, National Register of Historic Places, Washington, D.C.